HARARE: India’s Kedar Jadhav blasted his highest score in Twenty20 internationals as they beat Zimbabwe by three runs in a tense finish to claim the three-match series 2-1 at the Harare Sports Club yesterday. Zimbabwe won the toss and chose to bowl first, restricting the tourists to 138 for six in their 20 overs on a slow wicket as Jadhav top-scored with 58 from 42 balls. But the hosts battled to keep up with the scoring rate and went into the final over of the match, bowled by Barinder Sran (2-31), needing 21 for victory. When the first two balls of the over went for 12 runs a sensational victory looked on the cards, but Sran came back well and bowled Elton Chigumbura (16) off the last delivery of the innings to leave Zimbabwe agonisingly short of a series victory. 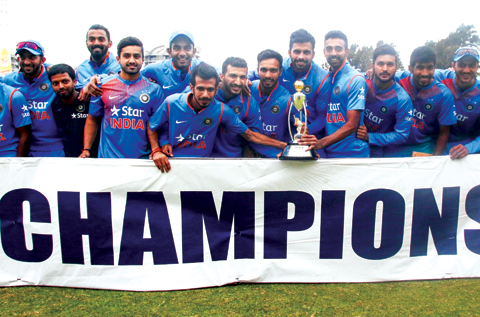 It was the first time on India’s six-match limited overs tour that they batted first and, after starts for Lokesh Rahul (22) and Ambati Rayudu (20), Jadhav provided the impetus the innings desperately needed as he blazed seven fours and a six.